The lack of confidence in SRH's middle order is showing in the approach of the openers. David Warner was forced to bat within himself against Punjab bowlers at Mohali. You rarely see him bat 20 overs in a game without getting close to a century. In fact, Warner’s fifty took 49 balls which makes it the slowest in his otherwise prolific IPL career. In the brief history of the Indian Premier League (IPL), we have seen a pattern among teams that have tended to win more matches across all seasons so far. To win games consistently, teams ought to be versatile. The same tricks don’t work in every game, or every season. Chennai Super Kings (CSK) have been one of the most successful franchises in IPL history. If you look only at their last season, they won games with the top order firing or with middle/lower order fighting back. They won games when Lungi Ngidi took wickets at the top, and when fast bowlers didn’t deliver, a spinner, whether a wrist spinner or a finger spinner, invariably stood up. Over the last three years, Sunrisers Hyderabad (SRH) have won games mainly with their bowling. Bhuvneshwar Kumar, Siddarth Kaul, Ashish Nehra, and Rashid Khan have always been among the top wicket-takers in the tournament and hardly ever gave away too many runs. Sunrisers, traditionally, rely on their bowlers to close games when batsmen put runs on the board batting first. So far this season, they haven’t been able to do that. 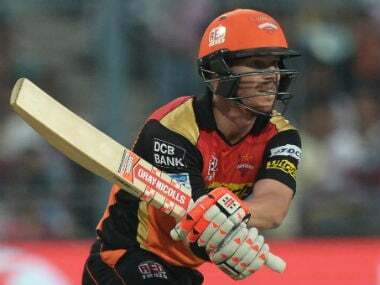 Part of the reason for Sunrisers’ lack of success with the ball is the fact that opposition batsmen are better prepared this year to handle their weaponry. Bhuvneshwar Kumar is definitely out of form. He isn’t nailing those yorkers with the same consistency that he was doing in the last three seasons. In the last three years, Kumar’s bowling average was 39, 14, and 21 and the economy was hovering around the 7-7.5 runs per over. This year so far, he is averaging 67.66 with the ball at an economy rate of 8.82. Easily his worst season ever. Kaul’s knuckle-ball was creating havoc last year, but batsmen are picking it better this year. His returns were always on the expensive side, but he had a knack of picking wickets. Last two years for Sunrisers, his bowling average was 26.04 and 18.75. This year, he is picking wickets at an average of 32.33. His economy, so far, is 8.43, on par with his overall IPL economy of 8.38. Rashid Khan, the million-dollar leggie from Afghanistan is still the spearhead, but batsmen seem to anticipate his googlies better, and by not looking to over-attack, they are seeing him off without much damage. Khan’s economy is still commendable, but he is picking wickets this year at 28-a-piece, as compared to around 21 over the last two years. The most successful bowler for Sunrisers so far this season has been Mohammad Nabi, and he may not even find a place in this eleven once Kane Williamson is fully fit. When the bowlers are not at their best, teams need fielders to grab half chances, but Sunrisers keep dropping catches at critical stages in the game. Yusuf Pathan dropping Mayank Agarwal in last night’s game against Kings XI Punjab was the latest exhibit. While SRH have not been flattering while defending, their attacking top-order has already given glimpses of brilliance twice in this season. In six games, they have posted 200-plus totals twice this season and their openers David Warner and Jonny Bairstow top the run charts. The middle order though, despite having quality and experience, seems terribly out of form, and that is the main cause of concern for the orange team. Manish Pandey is a shadow of his best in the last two years. Deepak Hooda is inconsistent. Vijay Shankar hasn’t quite capitalised on his starts. And Yusuf Pathan isn’t the same Yusuf Pathan we once knew. The batting averages don’t always send the complete story in T20 cricket, but the strike rates are always telling. This year, the strike rate for Pandey and Pathan are 93 and 86 per hundred balls. Hooda and Shankar are scoring at 116 and 131. Contrast this with David Warner who is not just scoring all the runs, but are also providing all the impetus to the innings with strike rates of 142 and 161. The lack of confidence in middle order is showing in the approach of the openers. David Warner was forced to bat within himself against Punjab bowlers at Mohali last night. You rarely see him bat 20 overs in a game without getting close to a century. In fact, Warner’s fifty took 49 balls which makes it the slowest in his otherwise prolific IPL career. 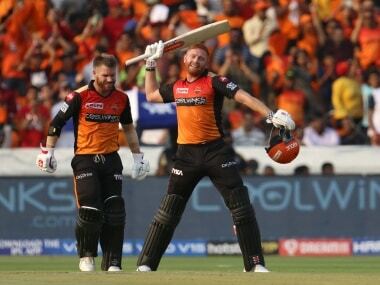 On a night when the team should have been looking to post 180 runs to give their bowlers the extra cushion against the dew factor, Sunrisers innings simply failed to take off. It was this conservative approach that eventually cost them the game. The team may need a change of personnel to infuse fresh ideas. Young Abhishek Sharma impressed everyone last year with his stroke play in the limited chances he got at Delhi Daredevils. He should get a look-in early this season in place of Pathan. In the bowling department, Khaleel can be tried ahead of Kaul to add some variety. Above all, the team needs a change of mindset. Like some other teams, Sunrisers need to realise that saving wickets for the death overs may not serve them well if they don’t have a destroyer like Andre Russell facing those overs. They need to up the ante earlier in the innings if they want to post winning totals, even at the risk of losing wickets and having to settle for below-par scores occasionally.